With our hardware you can control your audio/video devices, lighting, security, climate, blinds/curtains, and automate it all! DIN-Rail and Rackmount modular controllers provide the ultimate in configuration flexibility. We have even the most demanding systems covered. A flexible data + power bus. CFLink is a scalable communication network that connects all your automation hardware in any topology. No expensive network hardware required. 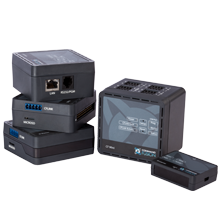 Over-engineered to become the new standard in automation networking. Not hidden behind closed doors. LAN Range : Wired Ethernet and Wi-Fi networking connectivity with cloud integration. Pro Range : Powered bulletproof bus, endlessly scalable - Why choose CFLink over Ethernet? See the hardware documentation on our wiki for detailed information on CommandFusion hardware. Printable PDF of our 2014 product catalog with spec sheets and application diagrams. Web-optimised PDF of our 2014 product catalog with spec sheets and application diagrams.